here is a Black Squirrel Adventure Triathlon, Black Squirrel Festival, Black Squirrel Music, Black Squirrel Gallery, Black Squirrel Radio, Black Squirrel Woodworking, Black Squirrel Books, Black Squirrel Brewing…even the Kent State campus police have adopted the black squirrel as a safety symbol. The list goes on and on! It started fifty years ago, February 1961. That’s when Larry Woodell, superintendent of grounds at Kent State University, and M. W. Staples, a retired executive of the Davey Tree Expert Co. imported ten black squirrels from Ontario, Canada. A second trip was made in March to obtain more squirrels. Both men worked with the Canadian Wildlife Service and American and Canadian Customs for over six months to gain permission to move the squirrels. By 1964, the Kent Record-Courier observed that there were up to 150 squirrels in the area. No similar concentrations existed in the central and eastern parts of Ohio prior to 1961. Today they own the campus. In addition to Kent, black squirrel sightings have been reported throughout northeast Ohio in places such as: Warren, Cleveland, Barberton, Akron, and Canton. Black Squirrels number only 1 in 10,000 squirrels found throughout North America. 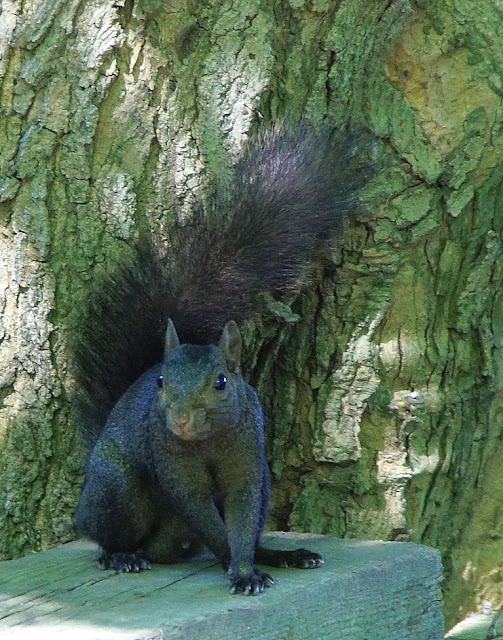 With odds like that, it makes black squirrels rare; when something is rare, people associate it with LUCK —one could conclude it’s very lucky to live in Kent, Ohio. The below photo was taken by me in Mogadore, Ohio. I used to work in Kent, Ohio, and the black squirrels were so common there that I easily forgot they are considered "rare". They were a daily sighting. Heck, we even saw gray squirrels with black tails or the other way around! Unfortunately, I don't have a photo of that for you. But, if you insist, I could go back for a visit until I get such a photo! Amazing looking Squirrel. Great capture. my sis has some of these in her yard in wisconsin. they're very handsome. He's a handsome one. I have never seen a black squirrel before and enjoyed learning about them. Thanks Misty. Wow! Gorgeous squirrel and post full of info! Thanks for hosting, Misty! Really a wonderful picture. It makes me want to see a black squirrel for the first time, in person. Such a beautiful shot. Visiting from Camera critters. Our CRITTERS, your comment will be greatly appreciated. Have a great Saturday! I think these are just beautiful creatures Misty. It is a definite rarity to see one around here, so this is a special treat. Wonderful photograph! wow look at that bushy tail. Hopping by from camera critters. Some Cardinal shots, come and see. I, too, forget they are rare. The population here is about 50/50 gray vs. black. I love their shining eyes! I first saw a black squirrel at Niagara Falls last October. They are pretty fantastic. What a beautiful squirrel! I've certainly not seen any this color.